Discover how a projected capacitive touchscreen technology (PCAP touchscreen) might turn your kitchen into like iPad devices. Yes, it’s hot. Flames rise. The inside is humid and noisy. Perhaps, your kitchen is messy. But, you can get rid of these the sooner than you think. Now, the wonder of touchscreen technology can now be served right inside your kitchen. With the advent of touchscreen technology, your kitchen can turn from chaotic to a well-organised one. It may sound expensive and far-fetched space technology. But, the idea here is not to replace your kitchen pieces into built-in displays. 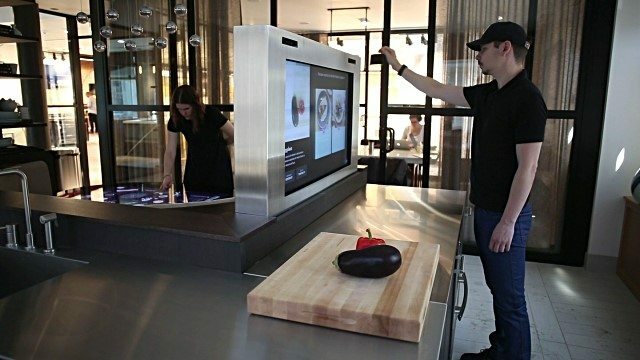 That is because touchscreen displays do not require a new kitchen counter. But rather, any surface can be converted into an interactive touch displays using projected capacitive touchscreens. So, if you are into a restaurant business, touchscreen technology may suit your operation. In a busy kitchen, touchscreen clarifies the orders. As a result, making mistakes are less likely to occur. Once a touchscreen display is used for placing orders, it heads directly to the kitchen. Thus, it could result into a higher volume if your kitchen service is efficient. Managers and staffs can also determine the time of an order once it is submitted to the kitchen. Hence, customers are fully informed on how long it will take to get their order. The touchscreen technology has also the capability to determine the location of your customer if you offer delivery services. Plus, it can also provide directions as well. These won’t just make your restaurant considerably more prepared for the future. But, it will help run all more productively and make it more beneficial, too. Touchscreen technology in the kitchen is something that numerous restaurants must-have to reduce mistake, waste, and irregularities. Let’s not argue with it. The survival ability of the touchscreens in the kitchen is such a hot debated topic. Whether we like it or not, the kitchen is a harsh environment. Overrun by moisture, grease, heat, open flames and grimy hands. Bringing touch technology into the kitchen takes a lot of courage. To help you out, here are some of the tips you might consider when installing one. It is very important to consider the right terminal for your kitchen. Choose a touchscreen display that is sealed. Make sure that the casing around the hardware is dust- and water-resistant. It would also be ideal that it can also withstand moisture and heat. Always choose a system that can easily respond when navigating the screen. There are also hardware that will help your kitchen staffs to enhance their efficiency and productivity. A software is also available to provide your business with more metrics as well as information you need to create consistency of your product or service. Getting the right mount is a standout. So, if you are looking for a perfect mount of your touchscreen, a reliable PCAP touchscreen manufacturer is a must. A projected capacitive touchscreen in your kitchen’s system helps you reduce training time, increase productivity, and boost your customers’ satisfaction. So, hire a touch tech expert today.